"I liked that ScreenCloud let me try it out before I committed to any long term contracts or specialty hardware. It was really easy to get a demo running in my living room. At the time, I joked with my wife that it only took 15 minutes to set up plus the 4-5 years I’ve been researching this field." How digital signage helped this deli to sell out of a previously "un-sellable" item. 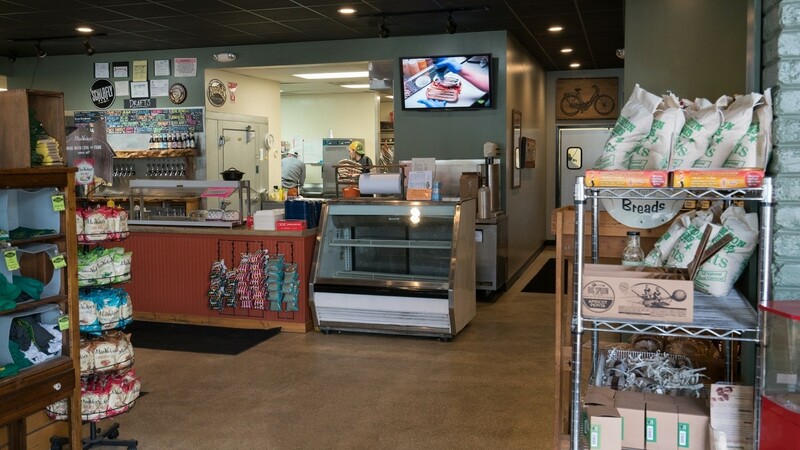 Mitchell’s Delicatessen is a deli located in Nashville that specializes in fresh artisan sandwiches using high quality ingredients with a focus on supporting the local economy. Michael Britt, a photographer, was employed by Mitchell’s Delicatessen to initially shoot web content, before discovering business aims which led to the implementation of a full digital signage strategy. Expand the sense of community with customers who are actively engaged in social media. Help solve some of the restaurant’s pain points like long lines, not enough parking and a large menu with speciality items being overlooked. For a freelance photographer to be able to easily manage and update content on a monthly basis from a desk at home. I was hired to shoot a few sandwich photos and the building exterior for a website rebuild of my favorite local deli. I had the idea to do a time-lapse video of customers ordering and picking up their food and the web designer decided to use it full screen on the landing page. Because of the success with the video, the client asked me back to shoot some more footage for their social networks. I started paying attention to the client’s social media feeds to see how their social marketing people were using my video and stills and I was underwhelmed to say the least. Here we were with some great content and it was barely being used on Facebook and not at all on Instagram or Twitter. The only place it shined was on the company website. At a meeting with the deli owners, I asked why they wanted to be on social media and what was their immediate goal for the work we were doing together. Eventually it came out that business was strong and they had a great standing in the local community but they wanted to expand that sense of community with their customers who are actively engaged in social media. Increasing business was secondary to having strong connections to their customers. We talked about some of the restaurant’s pain points like long lines, not enough parking and a large menu with specialty items being overlooked. On an iPad, I showed them a couple of videos I created using Adobe Spark Video with underperforming menu items that I thought were being overlooked. I also put together a slideshow video using customer Instagram posts that placed the comment over the image. Customers had been posting glowing and eloquent praises about the deli for several years. I suggested we tap into that energy and instead of contests or other promotions, we give $10 gift cards out to repost customer generated content and use it in-store on a digital signage screen along with the content I was creating. After factoring in that studies show a 35% decrease in perceived wait times while in line (another pain point for the business), setting up a digital signage screen was an easy sell. I originally wanted a monitor with built-in capability to run the Android software and ScreenCloud but the owners delayed purchasing my initial recommendation. This was all new territory for them so I found a nice Sony TV that was half the price of my initial recommendation and they ordered it immediately. I think it’s best not to get too hung up on hardware at the beginning of this process. I have Screencloud running on my personal Amazon Fire TV box which is being replaced now that Amazon is shipping the updated Fire Stick. I used Adobe Spark to create video content that gets shown on my client’s digital screen using ScreenCloud. Short pieces are also used on their website and looping on social media. With Adobe Spark, I can easily combine stills, video, text and music using a cloud based app for quick client turn around. Last week, I shot a video at 3pm and had it in ScreenCloud playlist rotation on their in-store monitor by 5pm on the same day. As a creative, I’ve been watching the digital signage market for several years. I’ve even lead a roundtable discussion at the Digital Signage Expo about creating 4K digital signage content in my role as a Sony Artisan of Imagery. Going into this project, I was aware of several hardware and software options. I liked that ScreenCloud let me try it out before I committed to any long term contracts or specialty hardware. It was really easy to get a demo running in my living room on a home theater flat screen with an Amazon Fire Box. At the time, I joked with my wife that it only took 15 minutes to set up plus the 4-5 years I’ve been researching this field. So far the digital signage screen has been a big hit with the employees and the customers. I set the start and stop times for the ScreenCloud playlists to run and it just works. The screen has never been blank or off during business hours since this project began running live three weeks ago. By clarifying the client’s goals and finding multiple uses for the visuals, the client was able achieve a much better ROI, a stronger social presence and a direct communication tool with customers in the store through digital signage. Additionally, I now have a monthly contract to create and implement interesting content for this three-pronged approach. And I’m able to easily manage the client’s in-store digital screen from my desk at home using ScreenCloud and Adobe Spark web applications. The only problematic feedback has been that customers think the video presentation is so good that it must be from a TV show or some other source. Content that is perceived as too good to have been generated by a small business is not a bad problem to have! Just wanted to update you with some results from the in-store signage at the deli. You may remember that we originally created a smoked chicken video. This was because the deli was having trouble selling the chickens and wanted to pull them from the specials menu. Despite having been a regular customer for over a year I didn't know they offered chickens so I used this as a test metric. The deli usually has 12 smoked chicken meals on offer. Pre-signage the most they'd ever sold was 4 out of 12 of those chickens. Since the launch of the digital signage, they have been playing the smoked chicken video as part of their digital signage playlist. I went in last Friday to pick up a chicken for myself and they were sold out. This had never happened before. Now they are regularly selling out and have even had to make a "sold out" sign for the chicken hot case. This increase in sales can be directly linked to promotion on the digital sign. I’m looking forward to being able to increase sales of other items using ScreenCloud digital signage and Adobe Spark Video.